A major fundraising initiative has been launched by Kilmurry G.A.A. club, which is said to benefit the community at large. The 375,ooo development will provide a facility for a variety of sporting activities as well as being available for social and recreational activities. The club is promoting a confined 300 members draw at a 1,000 entry with a prize fund of 50,000. First prize will be 40,000, second prize 6,000 and third prize 4,000. It will be possible to enter under an instalment system. The proceeds are going towards the building of a much-needed complex at Pairc Mhic Ghearailt, Kilmurry. The launch took place at the club's Sponsor showrooms O'Leary's, Lissarda Main Audi-VW dealer with Billy Morgan as guest speaker. This great Nemo Rangers supremo is without doubt the most successful personality in the history or Cork football. His captaining of Cork to All Ireland glory in 1973 and managing the rebels to successive titles in 1989 and 1990 are just the highlights of a successful career at provincial, county and club levels. The club feels very fortunate and honoured in having such a legend present on the night. The background to this event is that for some time it had become apparent that to cater for the needs of an ever-increasing number of young members, facilities at Pairc Mhic Ghearailt, Chill Mhuire needed to be upgraded. At present facilities consists of a playing pitch and dressing rooms. In September 2001 an AGM of the club decided to build a complex incorporating a sports hall, meeting room, kitchen, storerooms, viewing balcony, plus additional changing showering and toilet facilities. National lottery funding from the Dept. of Sport, Tourism and Recreation was applied for, and a grant of 125,000 was awarded. Plans were drawn up by DL Group, Consulting Engineers, and full planning permission was sought and has been granted. Tenders for the work were invited and from a number submitted, one has been selected and contract signing is imminent. A fund raising committee was put in place and after extensive consultation and research, decided on the format of the draw and is confident that with the backing of members and supporters, it will be an outstanding success. This committee consists of Richard Hinchion Chairman, Mary Down, Hon. Sec., Donal O'Leary, Treasurer, Fr. Martin O'Driscoll, William Murphy, Billy Crowley, ML White, Paddy Crowley, John Hinchion and Noel O'Dowd. The cost of the project is 375,000, which leaves a sum of 250,000 to be raised, which is the amount targeted in the draw. The feeling within the club is that the new facility will be of enormous benefit particularly in the organising of games/playing activities for the large number of young members, when weather conditions are bad and during the long winter months. It will also save the playing field from considerable wear and tear currently being incurred, particularly during early season training. The complex will be suitable for a wide variety of sporting activities such as basketball, badminton, bowls, table tennis, gymnastics, boxing, martial arts etc. It will also be available for social and recreational activities such as card playing, dancing, concerts, community parties, presentations, senior citizens activities, to name but a few. Access to the fully fitted kitchen means that a comprehensive range of refreshments, hot or cold can be served on these occasions. It will also be possible to provide refreshments for home and visiting teams in comfortable, hygienic conditions. At present any such refreshments are provided in obviously unsuitable conditions in the dressing rooms. It is generally acknowledged that in the present socio - economic climate, it is getting more and more difficulty to keep young people involved in healthy sporting and recreational activities, particularly when they reach the crucial teen years. The ever-increasing culture of sedentary/couch potato type leisure activity so readily available to young people needs to be countered in a positive way. 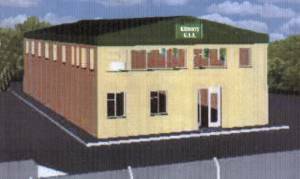 The provision of costly but vital facilities such as that being put in place by Kilmurry G.A.A. Club is essential if a serious effort is to be made to halt or reverse present trends. The club is aware of the magnitude of this undertaking both in raising the necessary finance and in maintaining and running such a complex. However they are confident that with the backing of the business sector in general and the support of the membership and community at large, all targets can be met and that in a short time a facility second to none will be up and running. The message from Kilmurry G.A.A. Club to the people of Kilmurry and the area in general is "a state of the art facility is being provided in the locality, it is up to you to maximise the benefits to be enjoyed from its existence". The club wishes to acknowledge the funding granted by the Dept. of Tourism, Sports and Recreation and the assistance of local public representatives in the securing of this funding. They express appreciation of the work of DL. Group Engineers, Sean Murphy, Solicitor, Kevin O'Connell Accountant and all who helped or advised in any way towards bringing the project to this stage.